Akagera Park management launched a new Day Visitor Centre complete with a tented boarding facility. Launched on Tuesday, the new 14-bed Rusizi Tented Lodge is located right at the heart of the Akagera National Park. The accommodation facility will supplement the Akagera Game Lodge, the main hotel inside the Eastern Province-based park. The centre, on the other hand, incorporates the park reception, a café souvenir shop and education centre. The infrastructure was set up with financial support of the US based Walton Family Foundation. The Foundation has disbursed $500,000 per annum, from 2010, to finance the construction of the facilities under a five-year financial assistance programme that will total $2.5 million upon completion. Rob Walton, the chairman of the foundation, and his wife, Melani Walton, attended the ceremony. Walton Family Foundation is a philanthropic organisation with a strong focus on conservation and biodiversity protection. According to the park’s officials, the new infrastructure is part of an integrated tourism development plan aimed at increasing revenues for the park’s long-term sustainability. The Minister of Trade and Industry, Francois Kanimba, who presided over the function, said new infrastructure was an important step towards the park’s achievement of self-reliance. “The Park has been performing well in the last three years or so…we expect it to do more, so that it can stop relying on aid. I also commend the support of Walton Foundation; local investors should borrow a leaf,” he said. Kanimba noted that revenue from the industry is progressively increasing. “Tourism will remain number one for many years. It earns the country over $280m per year. This explains why we are committed to supporting the industry,” said Kanimba. Jes Gruner, the Manager of Akagera Park, the largest in the country, noted that proper management and infrastructure development drastically increased the number of tourists. “In 2011, we had 20,000 tourists. In 2012 they increased to 23,000. The park has seen 40 per cent increase in visitor numbers and 73 per cent increase in revenue over the last three years,” he said. Akagera Park, African Parks and Rwanda Development Board partnered to form the Akagera Management Company (AMC). This is a 20-year joint management agreement with a vision to restore, develop and manage the park to international standards. Rica Rwigamba, Head of Rwanda Tourism and Conservation, RDB, said that tourism industry would increase its revenue by a large margin at the end of the year 2014. “We want our revenues to increase to $317million by next year,” she said. Akagera National Park was founded in 1934. The growth of information communication technologies will increase employment and boost the country’s competitiveness and economic growth overtime,” Jean Philbert Nsengimana, the youth and ICT minister, has said. Nsengimana added that this would also ensure provision of quality services and products. He was speaking at the launch of Techno Brain, an international software development company, at Umubano Hotel in Kacyiru, Kigali on Tuesday. A modern IT laboratory, with fully-equipped ICT infrastructure, was also unveiled during the event. Yvette Uwineza, the Techno Brain country manager, said the facility was one of the efforts by the firm to contribute to the country’s growing ICT sector. The firm, which started operations in June last year, employs 20 Rwandans and is expected to recruit over 100 more in the coming months. It recently won a tender to train the Rwanda Development Board staff in ICT use. Rwanda’s ICT landscape has evolved greatly in the last 10 years, especially after the laying of the fibre optic cable and the introduction the National Data Centre and e-governance services, as well as the rise in mobile telephony penetration. The International Telecommunication Union 2012 report ranked Rwanda as one of the developing nations with vibrant ICT markets, along with Bahrain, Brazil, Ghana, Kenya, and Saudi Arabia. Despite being an ideal tourist destination, many Rwandans have continued to ignore the beauty of their country while foreigners remain the best story tellers of the country’s beauty and wonders. When Joe McDonald and Mary Ann, an American couple landed in Rwanda in 2003 for the first time, their main destination was the home to the rare mountain gorillas, the Volcanoes National Park. On January 5, they celebrated their 75th visit to the gorillas. “We decided to come very often and our 75th visit is not the last. We will keep coming until we reach hundred times and more,” Mary Ann disclosed adding that every year they make up to three visits to the country and five rounds in the park. The couple has spent around US$ 1m in the visits with the friends they brought on board. “There is no other place in the world where you can be so close to large wild animals and be safe,” McDonald told The New Times shortly after completing their record breaking visit on January 5. Officials in the tourism department in the Rwanda Development Board (RDB) say they have never registered such a record from any Rwandan. Not even for ‘smaller’ wonderful packages such as the canopy walk in Nyungwe and the game safari in Akagera that are sold by various tour operators. But although the number of tourists in general increased from 18,865 in 2009 to 27,000 tourists in 2011, according to statistics from RDB, Rwandans always lag behind their foreign counterparts in visiting parks, except in the Akagera National Park where about 10,362 Rwandans were registered to have visited the park, compared to 8,649 foreign tourists, in 2011. 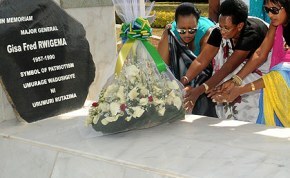 There are also fewer Rwandans visiting the six museums and 80 historical sites in the country. Statistics from the Institute of National Museums of Rwanda (IMNR) indicate that by June 2012, of the 151,000 visitors to the six museums, 100,666 were Rwandans, an insignificant number considering their target is 600,000 local and foreign visitors. Despite a steady increase in the number of park activities bought by Rwandans – 10,263 and 13,172 in 2010 and 2011- RDB believes they are still very few. The explanations offered by Rwandans for not visiting the various tourist sites are diverse, including the most common one that prices are very high. Most people The New Times talked to said they visit some of these sites only when the companies or institutions they work for plan to visit the parks, usually once a year. Otherwise, a family can barely plan a visit to a tourist site. According to Innocent Bahati, a civil society activist, many costs involved such as transport, entry fees, picnic and sometimes accommodation make visiting tourist sites expensive. “I feel that Rwandans, like most Africans, would rather visit places outside their own country,” observed Darla Rudakubana who visited Rubavu Beach once, adding that she has only started thinking of Rwanda as a tourist attraction recently. To visit a park, a Rwandan resident pays about Rwf 5,000 and Rwf 30,000 against US$ 60 and US$750 for foreigners in Nyungwe National Park and Volcano National Park respectively. In museums, the entry fee for locals is Rwf 1,000 against Rwf 6,000 for foreigners. Unfortunately, there is no fee set for the historical sites, regrets Alphonse B. Umulisa, the Director General of IMNR in charge of cultural tourism. And yet, most Rwandans don’t visit these either. But Rica Rwigamba, the Director General of tourism and conservation at RDB, says the issue of price is an excuse because someone can spend much more on a night out with friends and family. Working with schools for study trips and marketing destinations are some of measures that Rwigamba thinks will increase the number of local tourists. Her views were echoed by Paulline Uwera who works with a telecom company in Kigali. “The only problem we are facing here is the mindset. People think tourism belongs to the wealthy that have time to waste and money to spend,” she says. This should be the case. Rwandans need to be proud of Rwanda. And what better way than to know the country’s most beautiful and historical sites. Prime Minister Pierre Damien Habumuremyi recently told parliament that studies done so far have shown that there are very high prospects of oil deposits in East Kivu Graben region of Rwanda. This is the first ever solid confirmation from government on the stretched exploration activity by the Canadaian exploration firm, Vanoil Energy Limited. The area covers parts of Nyungwe and Gishwati forests, and Lake Kivu. Vanoil Energy Ltd, which was previously known as Vangold Resources Ltd, has explored for oil in the area for over five years. Earlier this year, government entered into an agreement with Vanoil to embark on airborne magnetic and gravity survey as an initial step. Requests for details were not fully answered as the Premier did not appear inclined to elaborate further. But he promised that the House will be kept in the know, as more findings come out. The announcement comes on the back of an article published in the Arabic Oil and Gas Journal that indicated that, Vanoil saw Sudan-like features on Rwandan seismic, indicating the possibility of oil discovery in Rwanda. “I don’t want to go into theoretical details which are technical, but I am assuring lawmakers that the second phase which will follow, of digging deeply, in depth and width begins soon; the contractor is here and as studies reveal new findings, we shall update you,” he said. On April 18, 2008, the explorer [then called Vangold Resources Ltd] had announced the completion of the first exploration phase which involved the use of satellite imagery. At the time, images showed “signs of seepage” but this did not “really tell much,” Vangold’s Country Manager, Joseph Katarebe, told The New Times, confirming that other thorough phases would then commence. Vangold started exploration in February 2007. Officials have in the past told The New Times that government is taking precautions, to get a good deal. When contacted for the latest, on Friday, Katarebe said the line ministry is best placed to give an update or any other comments. In 2010, the oil exploration programme was transferred from the Ministry of Infrastructure to the Ministry of Natural Resources. Minister Stanislas Kamanzi could not be reached, for comment, by press time. Whereas oil exploration in Rwanda began later, Uganda, Rwanda’s neighbour to the north, began exploring oil as early as 1920s and it was not until 2006 that the first oil discovery was made in the Albertine Graben, a region on the Uganda-DRC border. Fireworks lit the sky above Gikondo Expo Ground on friday to signal the launch of the Prosperity Expo in honor of the 25th anniversary of the Rwanda Patriotic Front-Inkotanyi. The exciting event was attended by high government officials, RPF members and private sector representatives among others. Participants were excited by renowned entertainers such as Jean Paul Samputu. According to officials of the Private Sector Federation (PSF), the expo has attracted about 500 exhibitors that will be showcasing different achievements attained under the leadership of the RPF. The expo reflects different achievements in many sectors such as in ICT, financial institutions, agro processing, SME promotion, governance, health and education among others. Faustin Mbundu, the chairman of PSF, explained that the Expo is an event that brings together the business community to celebrate what they have achieved under the good leadership of RPF that created for them a favorable business environment. He mentioned that there has been the establishment of the Public Private Dialogue where both public officials and private sector meet to discuss different issues in order to get harmony for sustainable development. Prior the Expo, different activities where youth have been helping vulnerable people to improve their lives were organized. Other activities such as football games and entertainment events continue across the country. All these activities will be closed on December 20 while celebrating RFF’s silver jubilee, according to François Ngarambe, the Secretary General of RPF. Ngarambe, who officially opened the expo, said that they opened the ground to business people so that they can showcase their achievements as they are committed to make private sector an engine of the national economic growth. The expo, which is scheduled to close on December 18, is held under the theme “Governance, Prosperity and Dignity to Our People” reflects the broad line of RPF leadership. He noted that the idea behind is to become self-reliant in order to uphold Rwanda’s dignity as it is envisaged in the RPF manifesto. Rwanda has risen two places in the overall ranking of the latest Mo Ibrahim Index of African Governance (IIAG) to 23rd. Rwanda has been part of seven countries that have significantly improved in their overall governance score since 2000 to 2011, according to the Index. The others are Liberia, Angola, Sierra Leone, Congo, Democratic Republic of Congo and Zambia. This is the sixth year in which governance outcomes in Africa have been measured, looking at both country and regional performances across four major categories -Safety and Rule of Law, Participation and Human Rights, Sustainable Economic Opportunity and Human Development – and 88 component indicators. According to the Mo Ibrahim Foundation, Mauritius came top in the overall index, followed by Cape Verde, Botswana and the Seychelles, continuing the same pattern as last year. Somalia was last, a position it has occupied since the index was first published. The country came last in each of the four category rankings. Somalia’s overall score has declined since 2006. Tanzania moved into the top 10 for the first time this year, while Liberia, Sierra Leone and Angola registered significant improvements. Sudan and South Sudan were not included this year. Speaking ahead of the index launch on Monday, the Sudanese-born philanthropist Mo Ibrahim told the Guardian that what Africa needs is a balanced development. Ibrahim also advised the governments in Kigali and Kinshasa together with their friends to sit down and talk to find a lasting solution to the chaos in the Democratic Republic of Congo. The biggest announcement of the night however was that there is no winner of the 2012 Mo Ibrahim Prize for African leadership. The $5-million prize, which is awarded each year to a democratically elected president who showed excellent leadership and a commitment to good governance, serves to encourage leaders of African countries to leave office after their terms expire instead of clinging onto power. There have been only three winners – former presidents Festus Mogae (Botswana), Joaquim Chissano (Mozambique) and Pedro Verona Pires (Cape Verde) – since the prize was set up six years ago. According to the prize committee, no candidate had met all of the tough criteria this year. The $5-million award is given over 10 years followed by $200,000 a year for life.